Phil & Kaja Foglio write the comic book series Girl genius which has won the World Science Fiction Society’s prestigious Hugo Award for Best Graphic Story, has been nominated for the Eisner Award, and has won several Web Cartoonist Awards. Girl Genius was named as one of the thirty most important comics of the decade by Comic Book Resources. Phil Foglio has been nominated for a Hugo Award as “Best Professional Artist.” You can see the comic at the Girl Genius website. Girl Genius novels — (2011-2014) This is a novelization of the Girl Genius comic. Publisher: The Industrial Revolution has escalated into all-out warfare. It has been sixteen years since the Heterodyne Boys, benevolent adventurers and inventors, disappeared under mysterious circumstances. Today, Europe is ruled by the Sparks, dynasties of mad scientists ruling over — and terrorizing — the hapless population with their bizarre inventions and unchecked power, while the downtrodden dream of the Hetrodynes’ return. At Transylvania Polygnostic University, a pretty, young student named Agatha Clay seems to have nothing but bad luck. Incapable of building anything that actually works, but dedicated to her studies, Agatha seems destined for a lackluster career as a minor lab assistant. 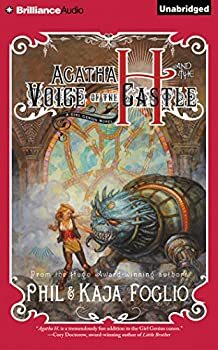 But when the University is overthrown by the ruthless tyrant Baron Klaus Wulfenbach, Agatha finds herself a prisoner aboard his massive airship Castle Wulfenbach — and it begins to look like she might carry a spark of Mad Science after all. 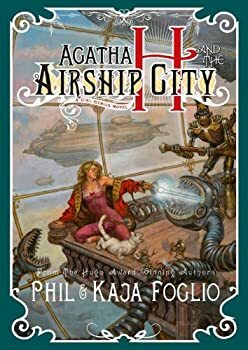 Agatha H. and the Airship City: Adventure! Romance! MAD SCIENCE! Girl Genius Omnibus — (2012- ) These are the hardback omnibus editions. 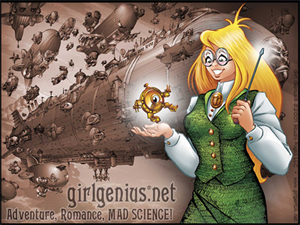 Find the webcomic at the Girl Genius website. GIRL GENIUS is also available in individual volumes. Publisher: Girl Genius, the multiple Hugo Award–winning steampunk webcomic by Phil and Kaja Foglio, now collected in hardcover! The Industrial Revolution has become all-out war! Mad Scientists, gifted with the Spark of genius, unleash insane inventions on an unprepared Europe. For centuries, the Heterodyne family of inventors kept the peace, but the last Heterodyne disappeared twenty years ago, leaving their ally Baron Klaus Wulfenbach to maintain order with his fleet of airships and army of unstoppable, if not very bright, Jaeger Monsters. At Transylvania Polygnostic University, Agatha Clay dreams of being a scientist herself, but her trouble concentrating dooms her to be a lowly minion at best. When her locket, a family heirloom, is stolen, Agatha shows signs of having the Spark in a spectacular, destructive fashion and captures the attention of the Baron — and the Baron’s handsome young son, Gilgamesh. 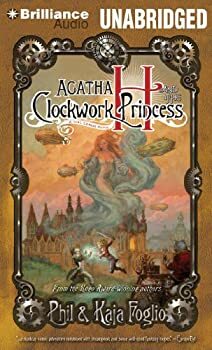 Swept up to the Baron’s Airship City, Agatha finds herself in the midst of the greatest minds of her generation, as well as palace intrigue, dashing heroes, and an imperial cat. Agatha may be the most brilliant mind of her generation and the key to control of the continent, but first, she just has to survive. Agatha Awakens: Kat loves it. Bill doesn’t. I don’t read many graphic novels — though I’ve tried many of them, they’re just not my thing. In fact, I only read one graphic novel and that’s GIRL GENIUS by Phil & Kaja Foglio. I love this comic and I must not be the only one —it’s won the Hugo Award three times (and lots of other awards, too). 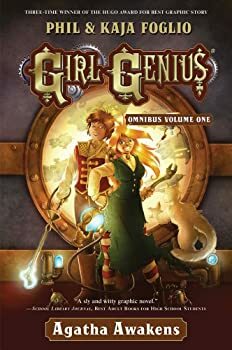 Therefore, I was thrilled to see that Tor is releasing hardback omnibus versions of GIRL GENIUS because this comic is a work of art that deserves to be beautifully bound and displayed on coffee tables everywhere.